With this sweeping tale of life on the World War II homefront, Newbery Honor author Kirby Larson brings her incredible talent to the Dear America series. When Pearl Harbor is attacked, America is finally unable to ignore the wars raging in Europe and Asia any longer. And one girl’s entire life is about to change when everything she knows is turned on its head. After the devastating attack on Pearl Harbor, where her brother, a navy sailor, is stationed, Piper Davis begins chronicling her compelling journey through one of history’s most tragic and unforgettable eras. Piper’s father is the pastor for a Japanese Baptist church, and when its members are taken away to Minidoka, Idaho, to be interned, Pastor Davis moves his family from Seattle to Idaho to be with his congregation. Piper is jealous of her older sister, who gets to remain at home and go off to work. Her brother, who survived the Pearl Harbor strike, is stationed in the Pacific, while her brother-in-law is shipped off to Europe to fight. 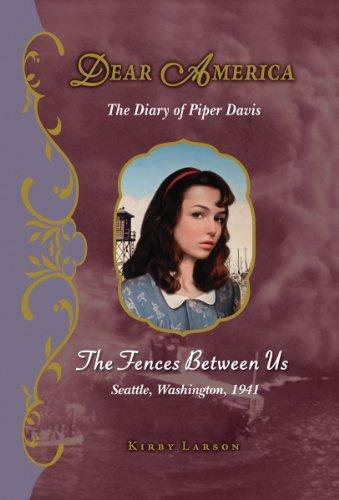 Piper, meanwhile, hates her new life, but soon, through her budding friendship with Betty, a Japanese-American girl who is interned in the camp, Piper learns how it important it is to bear witness to the events that were bound to change America. Kirby Larson is the acclaimed author of the 2007 Newbery Honor Book, Hattie Big Sky, a young adult historical novel she wrote inspired by her great-grandmother, Hattie Inez Brooks Wright, who homesteaded by herself in eastern Montana as a young woman. Her passion for historical fiction continues with two new titles: The Fences Between Us and The Friendship Doll. Kirby lives in Kenmore, Washington with her husband, Neil. Who gives Piper her diary? Why does that make it especially meaningful for her? Why does Piper call her diary Dee Dee? Why didn’t Piper stop to help Betty Sato when Betty was confronted and spat on by the boys at school? What would you have done? When Piper tells her father about the origami crane project, he tells her, “A tree is known by its fruit.” What does Pop mean? Do you think Piper’s father made the right decision when he chose to take her to Idaho with him so they could be near the Minidoka War Relocation Center? Explain why Japanese living in the United States were forced to give up their possessions and many of their freedoms to live in incarceration camps like Minidoka? Were both Issei and Nisei treated in the same way? What are some of the worst things about life at Minidoka? What are some activities the incarcerees developed to make life more bearable there? During World War II, there was a popular poster that read, “Loose Lips Might Sink Ships.” What do you think that means? Why does Betty Sato’s brother, Jim, decide to enlist in the United States Army’s all- Japanese unit—the 442nd Regimental Combat Team?